Ok, even though I spent a lot of time in my studio during January, I just didn't have much in the way of finishes. In fact, I almost forgot about over a yard of fabric used in making blocks for last month's FCQ EQuilter. It did help! Not the best start but definitely not bad either. I finished January's OMG with about two days to spare. And, honestly, I thought I had my nose to the grindstone to get it done. I picked what I thought would be fairly easy to accomplish -- you know start with success! My goal for February is to finish this top. It is mystery 12 from Mysteries for Relay. I started it in 2010 (or so I think...) when we lived in Greentown, PA. I think I put it away because I wasn't sure what to do with it. It is 48" square or so. I don't really need a square quilt. At least not one that big as I have no wall to hang it on. Perhaps what I really should do is draw this in EQ and see what I can do to make it look finished. I doubt if I have enough of any of the fabric to border it but I might. Any suggestions? I'm open to ideas from everyone. So, that's my one monthly goal for February. 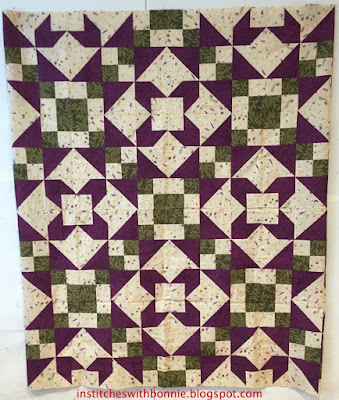 Make this quilt a finished flimsie. I considered having the whole quilt finished as my goal but I know I've got a lot of things scheduled this month, it's only 29 days and 2 days have already passed and don't want to not finish the goal. If I finished it I'd also have to find some backing for it and I doubt I have anything in my stash that would be reasonable. But if get rolling on this, I'll quilt it too. Oooh. Wouldn't that be terrific...another quilt off the UFO list! I'm linking up with Red Letter Quilts' One Monthly Goal Link Up and Linky Tuesday at Freemotion by the River. 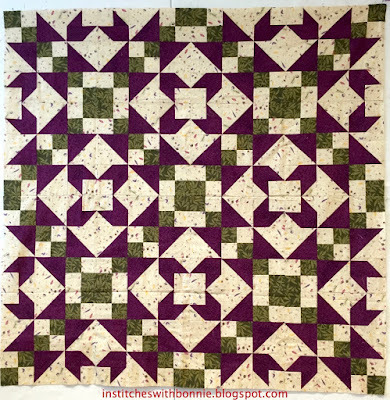 While reading about the square quilt, I thought, "she should take off one column and sew it on the bottom." Great minds think alike, right? I love the blocks and the secondary design on the revision. I'm eager to see this one progress. Good luck with your goal. It's a beautiful quilt. 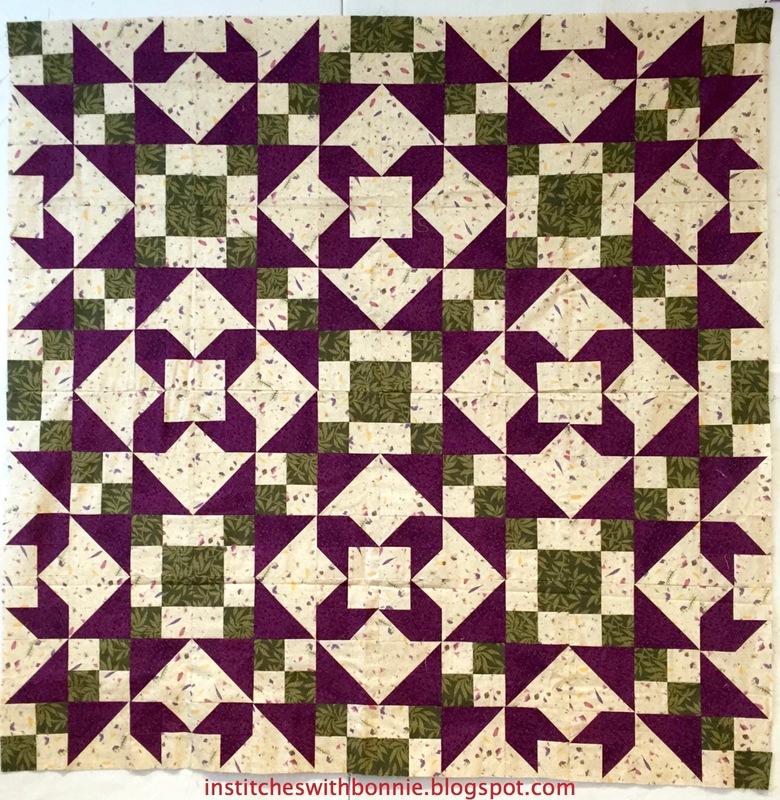 A recent discussion on Stashbusters allowed that smaller square quilts are very desirable to use as crib quilts. Personally, I prefer baby quilts that are not made with juvenile novelty fabrics. Sounds like you've got a plan to at least get started with. 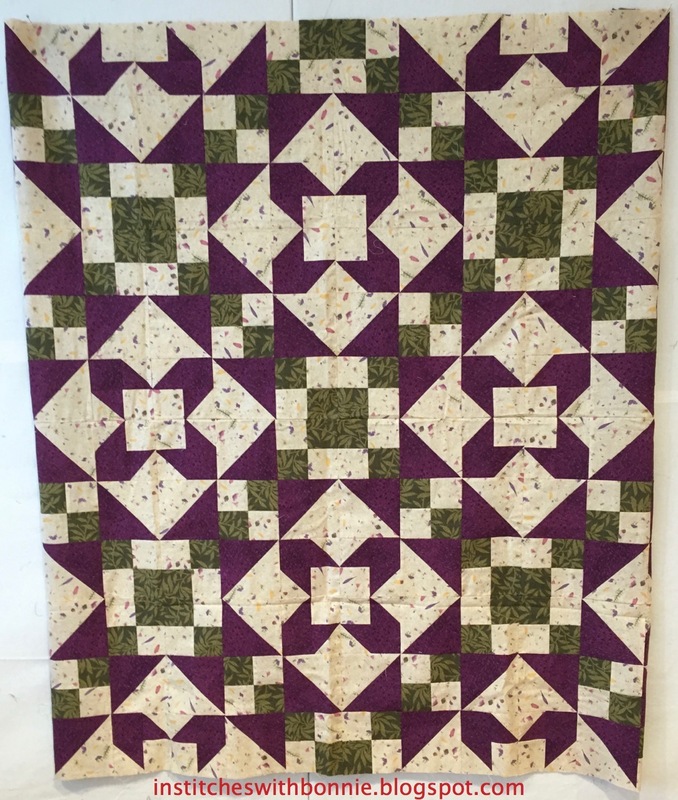 Not all quilts need borders, this one would look good just finished as is.